As a teenager in the ‘90s, my introduction to punk legend Mike Watt came not from his work in the influential ‘80s bands Minutemen and Firehose, but from his first solo album Ball-Hog or Tugboat? that came out in early 1995. Even then, it was the inclusion of Eddie Vedder (Pearl Jam) and Dave Grohl (Nirvana/Foo Fighters) on the album’s lead single “Against The 70’s” that even enticed me to pick up the album in the first place. The fact that Ball-Hog or Tugboat? turned out to include an alternative all-star list of backing musicians – J Mascis (Dinosaur Jr.), Evan Dando (The Lemonheads), Adam Horowitz (Beastie Boys), Flea (Red Hot Chili Peppers), Frank Black (Pixies), Thurston Moore (Sonic Youth), and more - made the pick-up all the more sweeter. While late to the party, I was so glad to have finally gotten my invitation to appreciate Watt. 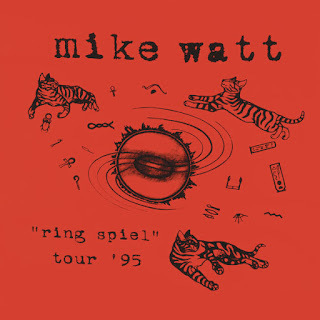 When Watt decided to tour behind Ball-Hog or Tugboat?, he brought Vedder and Grohl along as part of his backing band, rounded out by some of Grohl’s Foo Fighters – Pat Smear and William Goldsmith. This pitch-perfect snapshot of the mid-90s alternative scene is presented on “Ring Spiel” Tour ’95, a brand new live album capturing the May 6, 1995 tour stop at The Metro in Chicago, IL. This 16-track sonic thrill ride is raw, vibrant, and beautifully unhinged at all the right moments. Watt’s gruff vocals and melodically adventurous bass lines are front and center, while his notable backing band elevates without ever over-stepping. Not content to just have the shows be a run-through of Ball-Hog or Tugboat? in its entirety, Watt’s setlist is a combination of just some of the album’s tracks, broken up by Firehose and Minutemen songs sprinkled in for good measure as well. The set is made even more eclectic with the inclusion of covers of Blue Oyster Cult (The Red and The Black”) and Madonna (“Secret Garden’), the latter of which features Smear on lead vocals. Watt even gave a slot to Vedder for an early version of “Habit,” which would eventually appear on Pearl Jam’s No Code the following year. “Ring Spiel” Tour ’95 pulls off the unique double success of being a super fun listen on its own merit, while also functioning as a historical sonic snapshot of a music scene in forward motion. On a personal level, I’m so glad that this concert got a proper release because it captures what I loved about the excitement and uncertainty of the mid-90s alternative scene. On a cultural level, I think it’s super important to be reminded of what an impact Watt has had in his career and who he has influenced along the way, as well as having the interesting side note of hearing two certifiable legends playing together at such an interesting moment in their careers. For all these reasons and more, “Ring Spiel” Tour ’95 is certainly worth the pick-up.